Do you celebrate the opening of an envelope? Do you make occasions, create traditions, unite over shared experiences? This Blackcurrant Vodka will sustain you through many successful celebrations. 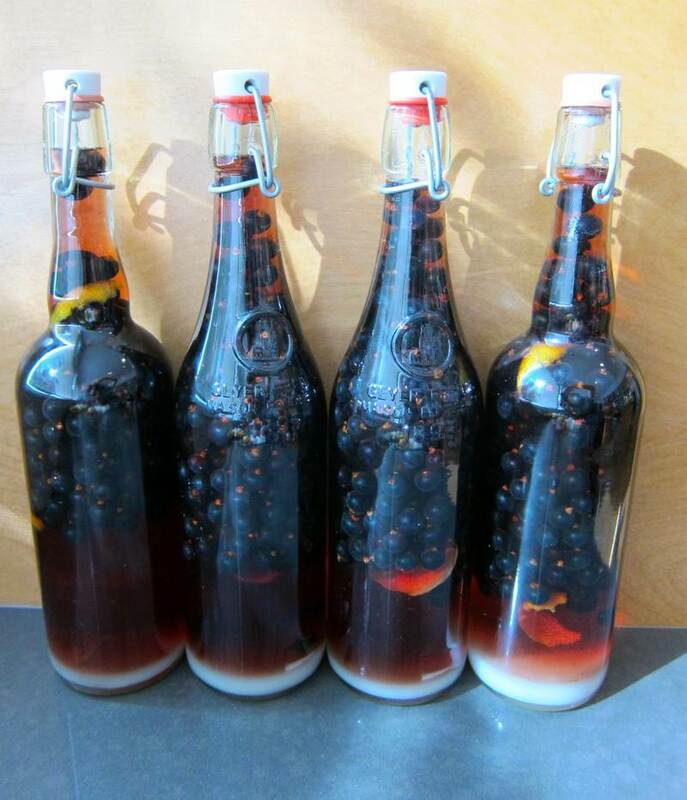 If you are able to delay gratification, you can make this port-like fruit liqueur now and toast in 2013 with your very own Blackcurrant Vodka. If you’re really endowed with self-control, the longer you keep it, the better it tastes. For those of you unwilling or unable to run off to the country to pick your own berries, check out the local outdoor fruit markets. 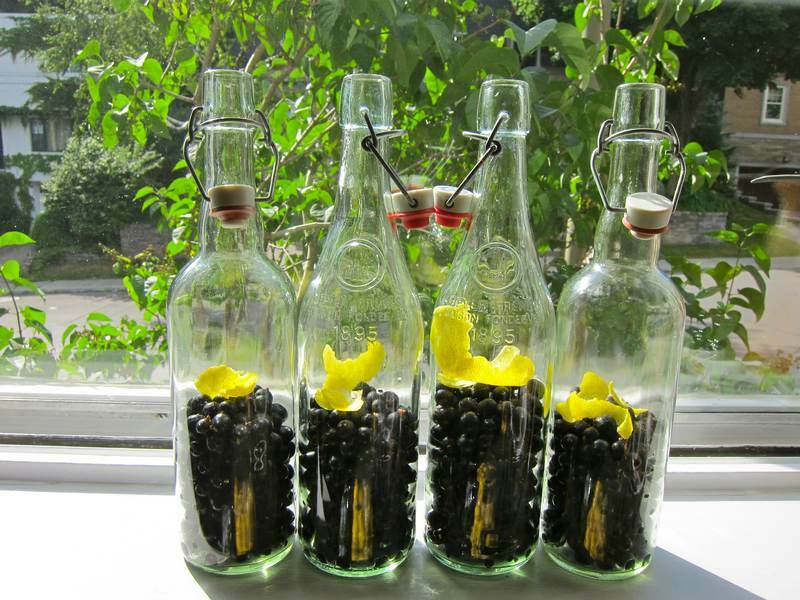 Fill each bottle with 1½ cups of blackcurrants and lemon peel. Use a funnel to add ¾ cup of sugar to each bottle. Use a funnel again to add 1 cup of vodka to each bottle. Top off each bottle with blackcurrant juice. Store in a cool, dark place. 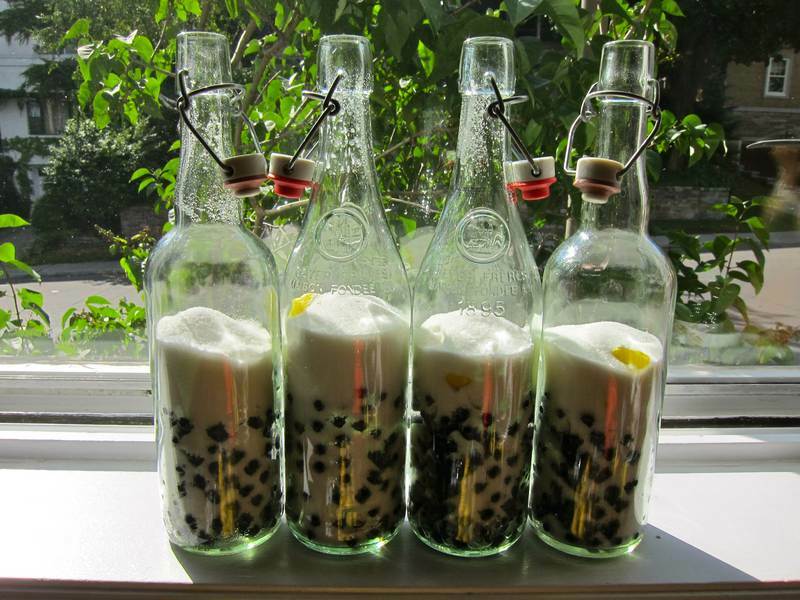 Shake or turn the bottles twice in the first month, then put them away and forget about them for about 5-6 months. When a bottle is finally opened, feel free to adjust the flavour with lemon, vodka or sugar. Serve straight in small shot glasses, or serve with fizzy mineral water and ice as a summer cooler. In case you think this was all my brilliant idea, think again. This recipe was generously shared by my food-expert sister, Julia Richardson. Check out her Blackcurrant Jam recipe. Ambrosia? Nirvana? Heaven! These stunning blackcurrants hail from the ecological, country farm, Paradis des Fruits, in Dunham, Quebec, where fruit picking is a fun family activity. Call ahead to verify availability. Hurry on up and send me your recipe suggestions before July 15th to win the Turkey BBQ Prize pack. This may be your lucky week. Perfect, I have black currant growing in my backyard!!! Where do you get the bottles from? Lucky you! Check out the jam recipe on recipe2recipe. Am having a senior moment. I’m pretty sure I got them at Loblaws for $5 filled with bubbly lemonade from France. Either there or at Metro on Sherbrooke and Victoria. Any bottle with a twist cap is fine too. As long as you can get it nice and clean. This recipe is so delightfully easy, you don’t have to twist my arm to bend my elbow! 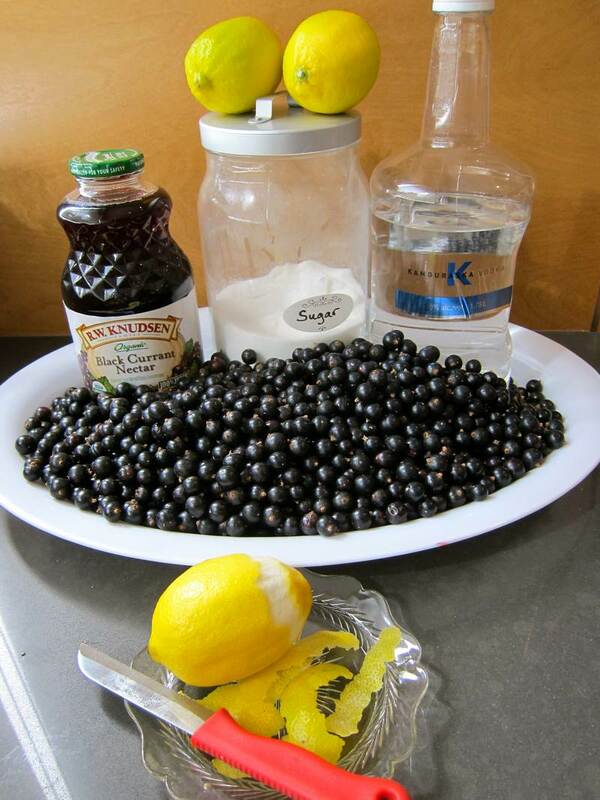 I just may devote myself to black-currant pickling while I’m in Montreal, to my dad’s ever-present military march sonic background. Getting Soused With Sousa! It is easy! You are right about that. The hardest part of making Blackcurrant Vodka is trying to cut the lemon peel thin enough so that it won’t break and not so thick that there’s pith. I think I’ll go sharpen my knives. 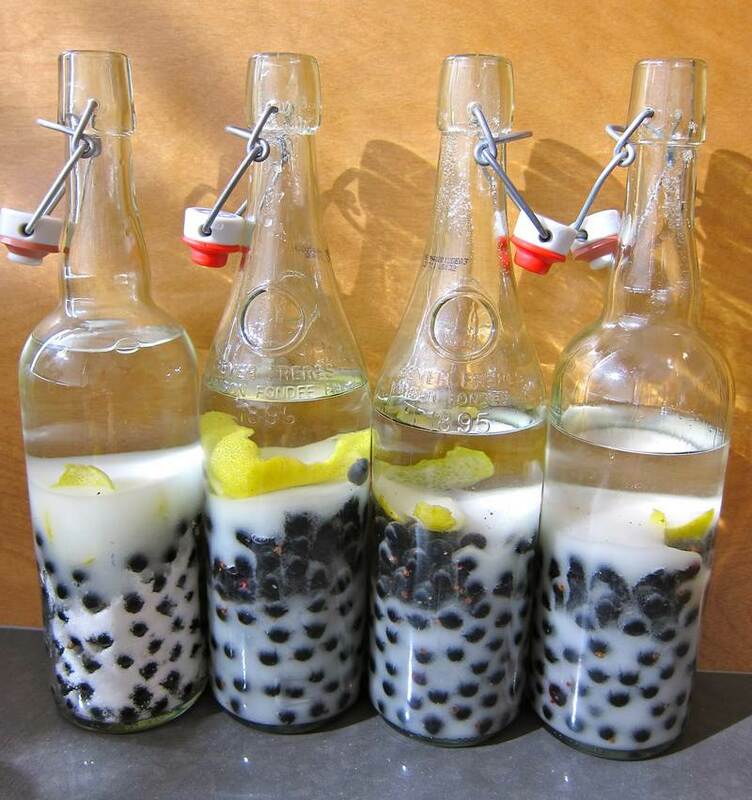 Oooh my sister-in-law who loves vodka will really enjoy this recipe. She’ll even pick the blackcurrants from the hedgerows around her home. Thanks for sharing!